Kuala Selangor Nature Park is located on the estuary of Selangor River or Sungai Selangor and has an area of about 240 hectares. 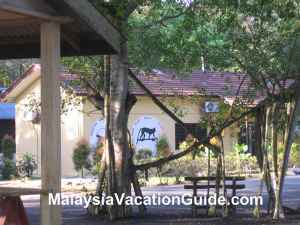 If you are coming from Kuala Lumpur, this park is about 60 to 70 minutes drive away. If you are visiting Malawati Hill, plan to spend a few hours here as it is located just at the foot of Malawati Hill. Those of you who are travelling from Kuala Lumpur to the north towns of Peninsular Malaysia such as Tanjung Karang, Sekinchan, Sabak Bernam, Teluk Intan, Kampung Koh or Sitiwan using this coastal way will pass by Kuala Selangor. It will be a good idea to make a stop and enjoy the natural surroundings of this park. The park signage at the main entrance. Also known as Taman Alam, this park was established in 1987 and belongs to the Selangor state government. 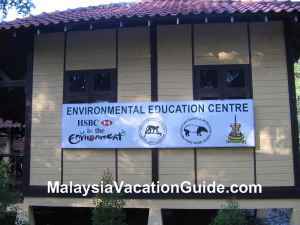 However, the management of the park has been given to Malaysian Nature Society, an Non Governmental Organisation. This park is well known for birds such as Milky Storks and herons. Other animals that can be easily spotted here include the macaques and the silver leaf monkeys. Migratory birds from the north such as Russia find this place a sanctuary for them to shelter during the cold winter months before migrating to the south hemisphere. Best time to see them is from September to March. The typical plants in this lowland dipterocarp forest that you can study and take note include the various species of palm trees, fungi, figs and ferns. Get your photography gears and try to take some shots of the birds, mammals and reptiles while you are here. Patience is needed as these creatures will usually move away from humans with the exception of the macaques and silver leaf monkeys. Herons and many other species of Malaysian and Migratory Birds. The entrance to Kuala Selangor Nature Park. There are benches you can sit. Some basic accommodationis available here. There is an information center that you can see to better understand the park. There are four trails that you can explore at this park. While exploring, remember to take your time and look out for the many flora and fauna. It is always a good idea to bring a hat to shield yourself from the sun, insect repellant, bottle of drinking water as the weather is usually hot and humid especially during the mid afternoon. Look out for the observation towers that you can use to get a better view of the sea, birds and other inhabitants of the forest. Coastal Bund Trail is about 1.7km and takes 2 hours to complete. Langur Trail is about 1.1km and takes 2 hours and 30 minutes to complete. Pangolin Trail is about 1km and takes 45 to 50 minutes to complete. Egret Trail is about 0.5km and takes 30 to 40 minutes to complete. Operation Hours: 8:30am to 6:00pm daily including Saturday and Sunday. Admission Fees: RM4 per adult and RM1 for student and children below 16. Malaysian Nature Society member pay RM2 per adult. You can purchase souvenirs and books at the souvenir shop before leaving the park. If you are driving and are coming from Kuala Lumpur or Petaling Jaya, take the NKVE and exit at Sungai Buluh toll plaza. Follow the trunk road towards the direction of Kuala Selangor. 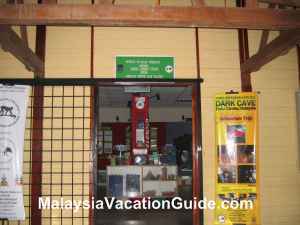 As you reach the town, look for the signage Kuala Selangor Nature Park. Follow the direction and you will not miss this place. The drive will take you about 1 hour. If you prefer to take a bus, go to Medan Pasar near HSBC Bank and UOB Bank, Kuala Lumpur and take bus No. 141 at a square with a clock. One way ticket fare is RM5.60 with the half hourly bus service starting from 6:30am to 7:30pm. The bus will stop at the new bus terminal in Kuala Selangor where you will have to take a taxi to this park. The cost of the taxi fare from here is approximately RM5. See the videos of the park.